Hold your breath. I’m about to take you on a high-adventure ride to some elevations where oxygen is in short supply. 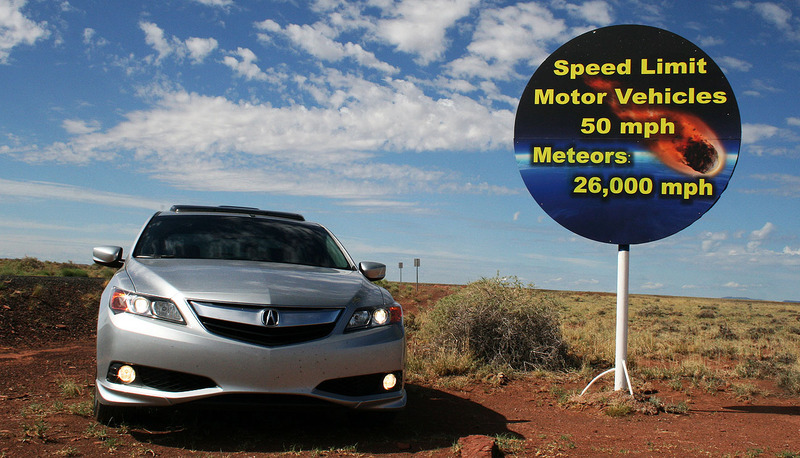 Last Friday, I took flight in my 2013 Acura ILX to head for the mile-high city of Denver, Colorado. My goal was to push my car to extreme elevations and to experience the inspiring scenery of the Rockies. I’ll share this trip write-up in a 3-part series. 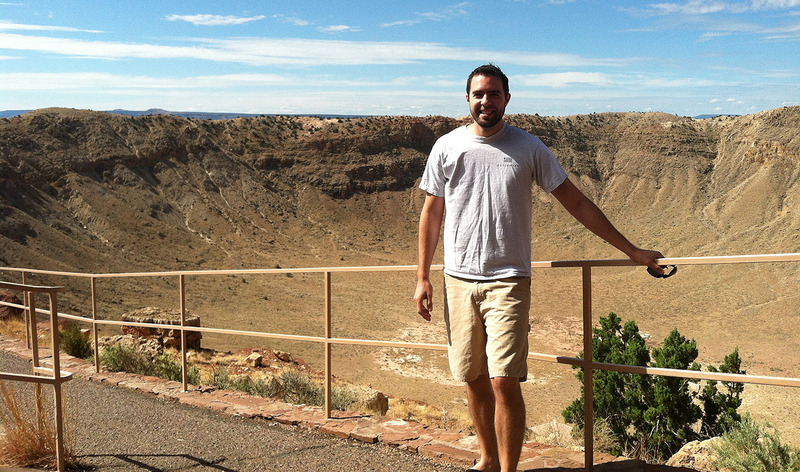 Just 3 hours northeast of the Phoenix area lies a meteor crater that was formed an estimated 50,000 years ago. If it weren’t for the multiple signs along Interstate 40 trying to lure drivers in, I probably wouldn’t have even known it existed. I couldn’t resist the temptation to have a look at what the billboards stated was the “best preserved impact site on earth.” A $16 entry fee later, I was standing at the rim of a 4,000-foot-wide hole in the ground. Mining engineer and businessman Daniel Barringer spent decades in the early 1900’s trying to find the meteor that created this gigantic impact site, to no avail. 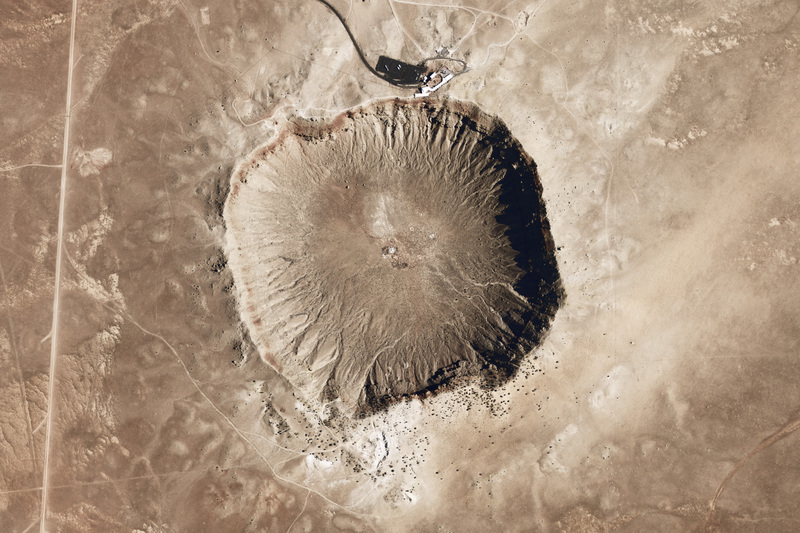 It was originally thought that the meteorite would be buried directly beneath the center of the crater. Drilling projects were unsuccessful. It is currently believed that the meteor vaporized upon impact. Only small fragments remain. 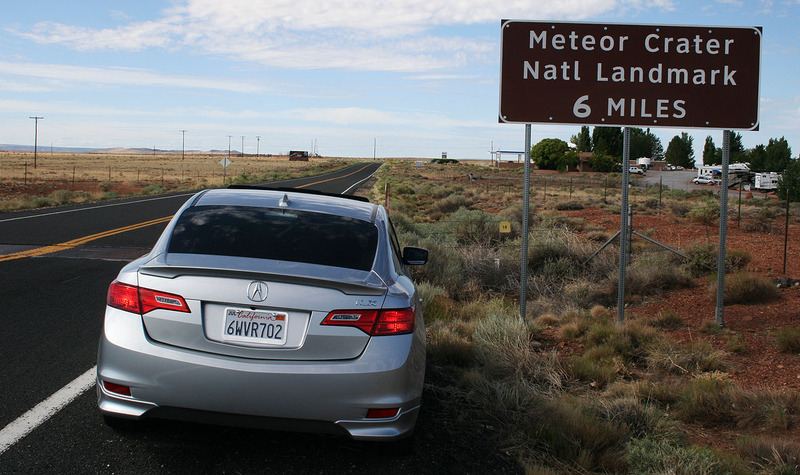 As the sign at the entrance to the site indicates, the meteor was traveling an estimated 26,000 miles per hour. My next pit stop satisfied an intense craving for a Taco Bell crunch wrap supreme at 10:30 in the morning in Holbrook, Arizona (breakfast of champions!). 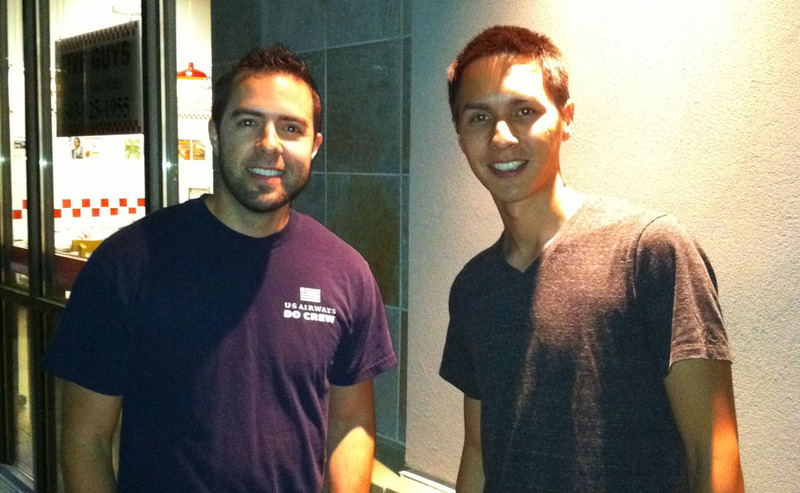 I had an interesting conversation with a guy named David in a blue Subaru WRX as I was fueling up. “Is that the new Acura?” he asked. I told him that yes, this was a new model. “That looks really sharp!” he said. After telling him a little more about my story with the car, “I’m sure glad you got the 6-speed.” I am too. While in Holbrook, I drove through town on what was formerly part of Route 66. There are a number of establishments that carry on the Route 66 style. I especially enjoyed “Empty Pockets” Saloon. 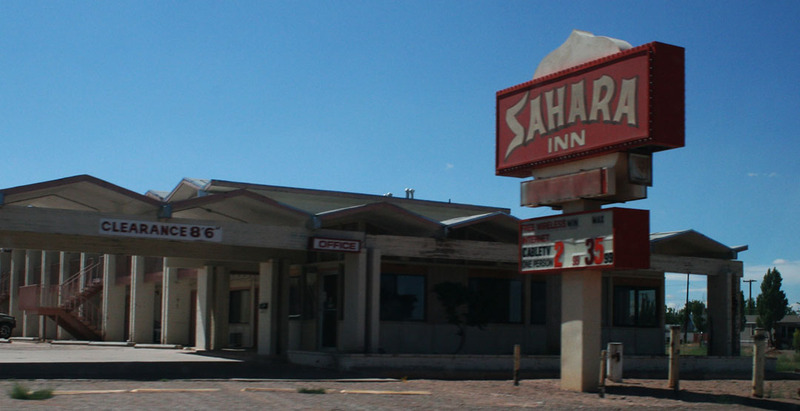 Sahara Inn. I thought for sure this place was long-since closed, but a look on Trip Advisor reveals that it’s still in business. It’s rated #15 out of 18 hotels in Holbrook, though. Be advised! Holbrook is only about 70 miles from the New Mexico state line, and that was my next destination. The Zuni Indian Reservation straddles the border and there are tourist traps advertising $7.99 “authentic Indian” blankets and $10 phone cards all over the place. Does anyone still use phone cards? The scenery can’t be beat, though. I’ve stopped here a number of times already, but it just seems appropriate to commemorate my entrance to the “Land of Enchantment” every time I pass this sign on Interstate 40. Gallup, New Mexico shares that same Route 66 DNA with Holbrook, so again we see some run-down relics of what may have at one time been really nice motels. 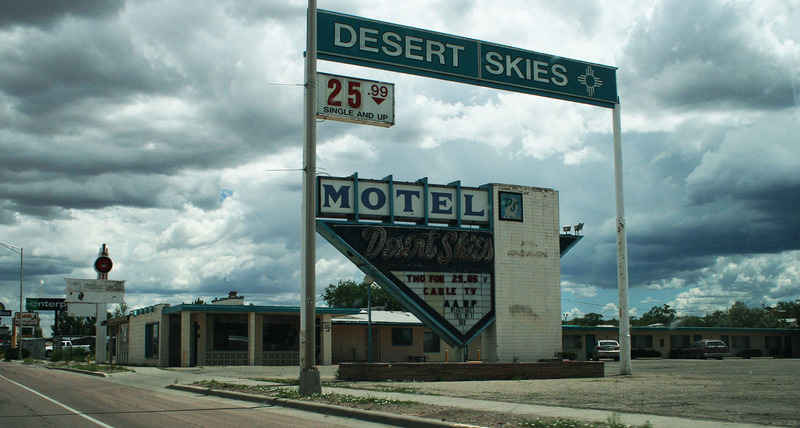 Desert Skies has a rate of $25/night. Bargain basement rates. I didn’t linger long enough to learn what kind of things “Zuni Fetishes Direct” sells. 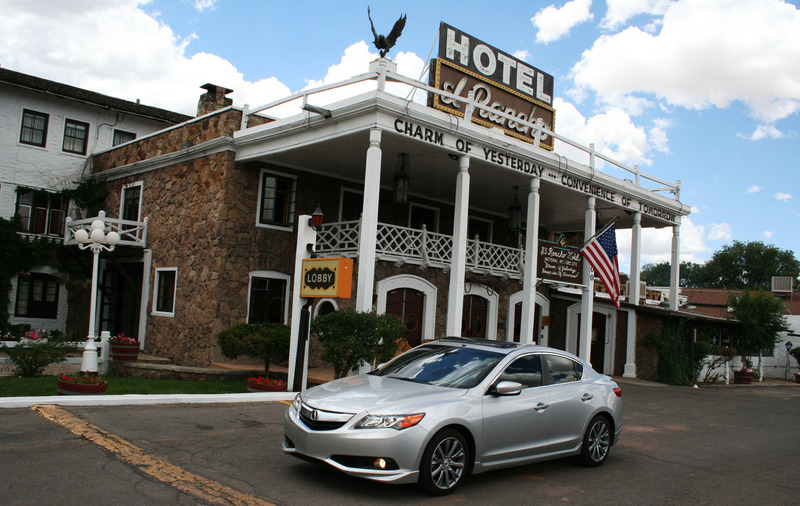 But just ahead, I pulled the ILX into the historic 1937 El Rancho Hotel. 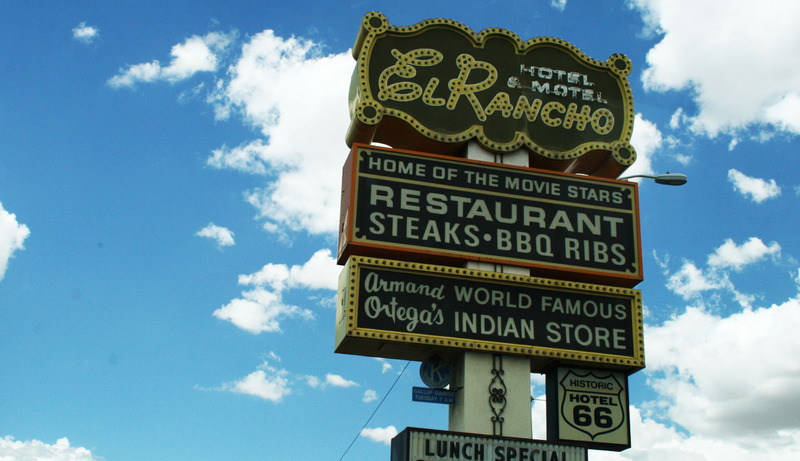 El Rancho’s claim to fame is that over the years, it has hosted such famous guests as John Wayne, Ronald Reagan, and Katherine Hepburn. Though the Interstate 40 bypass of Route 66 cost El Rancho some business, a renovation effort has again made it an attractive place to stay. A vintage postcard shows the hotel in its original glory. “The Charm of Yesterday; The Convenience of Tomorrow” is still the motto today. 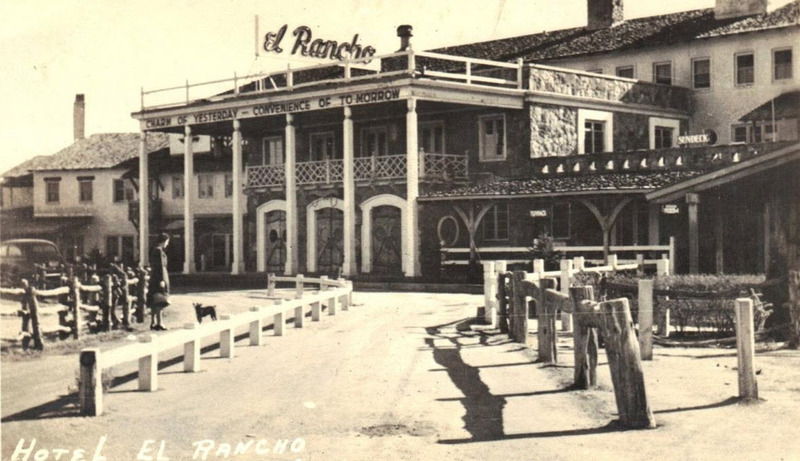 Surprisingly little has changed from an appearance perspective in El Rancho’s 76 years of existence. 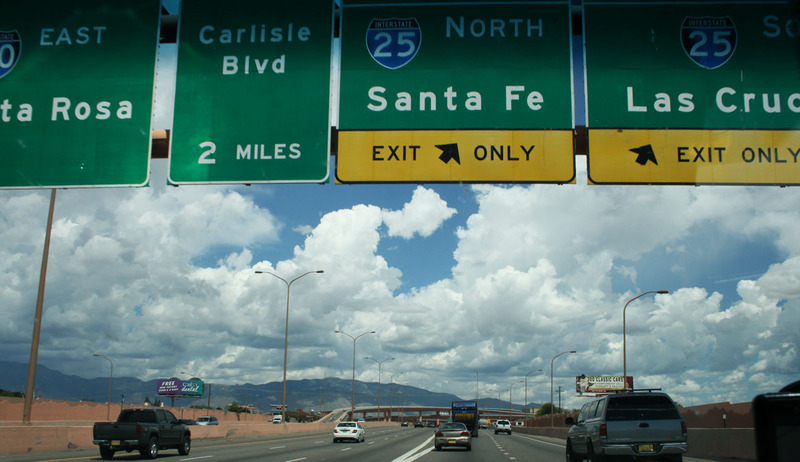 Eastward Ho to Albuquerque we go, then north on Interstate 25 toward Santa Fe. 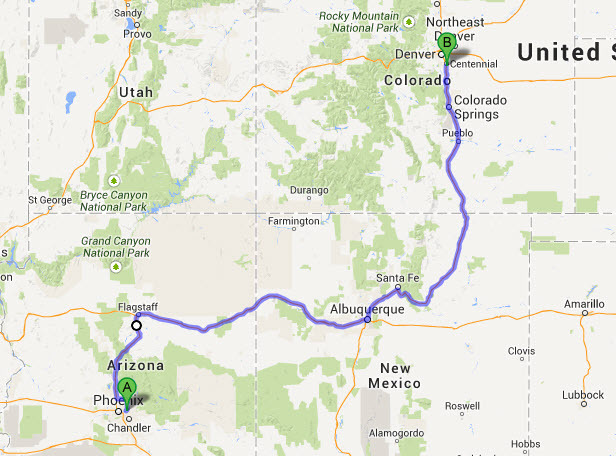 ABQ marked the halfway point for this drive. I took the opportunity to stretch my legs, fuel up the ILX with some premium fuel, and take a bathroom break at the Flying J service station. The high desert pines of Santa Fe give way to some open grassland in northern New Mexico. I breezed through Las Vegas without even deactivating my cruise control in 6th gear. Unlike the Las Vegas in Nevada, this one doesn’t offer much to see. Well, except for 27 “modern” gas stations and 34 restaurants, per the blue sign at the south entrance to town. I’ve always been intrigued with how New Mexico provides these types of stats for each town. Anyone remember such classics? 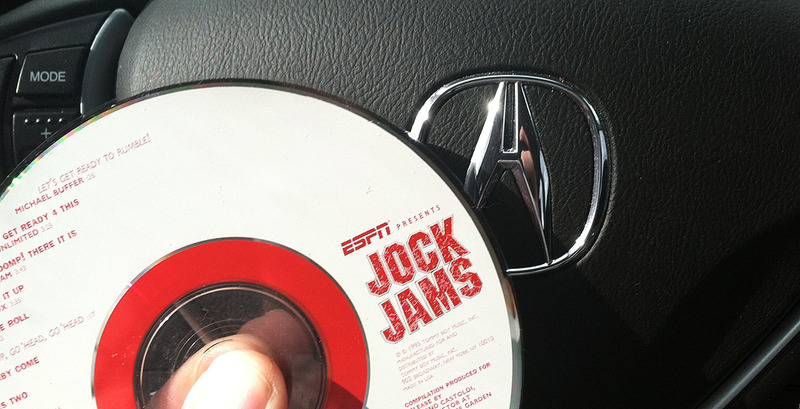 I listened to volumes 1 through 4 of JOCK JAMS to get me through northern New Mexico. I’ve had these CDs for 15 years, but they still get the blood pumping every time. As I neared the NM / CO state line, storm clouds descended but I saw that Denver finally was a mere 250 miles away. 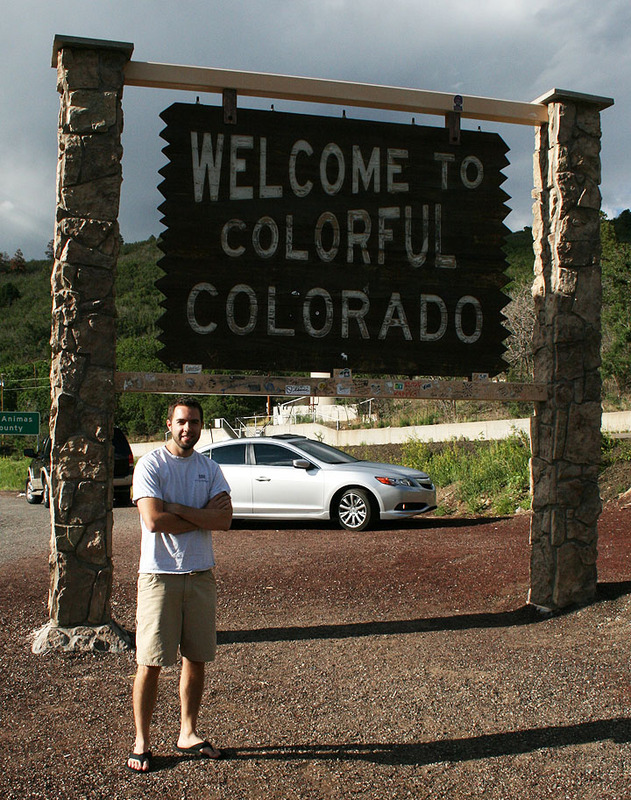 Thanks to the random travelers who took my picture with the Colorado entrance sign. I was driving the wrong car for this particular picture, but I still felt it worth a stop. 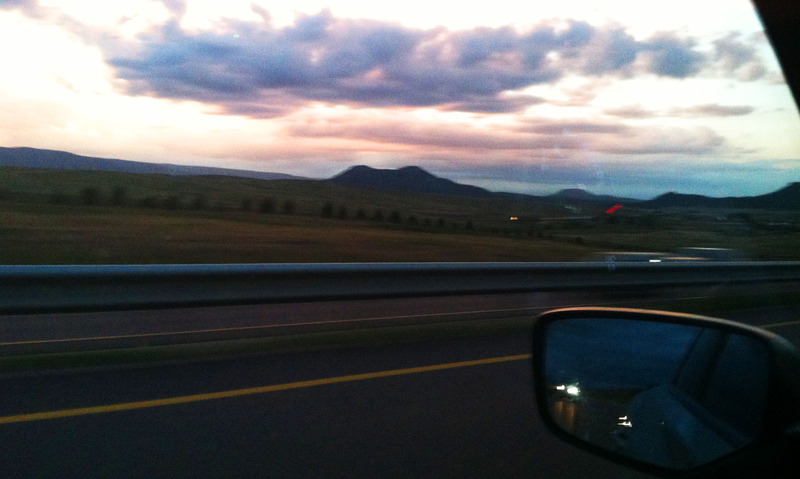 Sunset on I-25 as I roll through Castle Rock, Colorado northbound. And finally, reunited with my friend Jason as we’re about to embark on our 4th road trip together. Jason and I have met up a number of times in the past, for trips to Bisbee, White Sands, and Sedona. 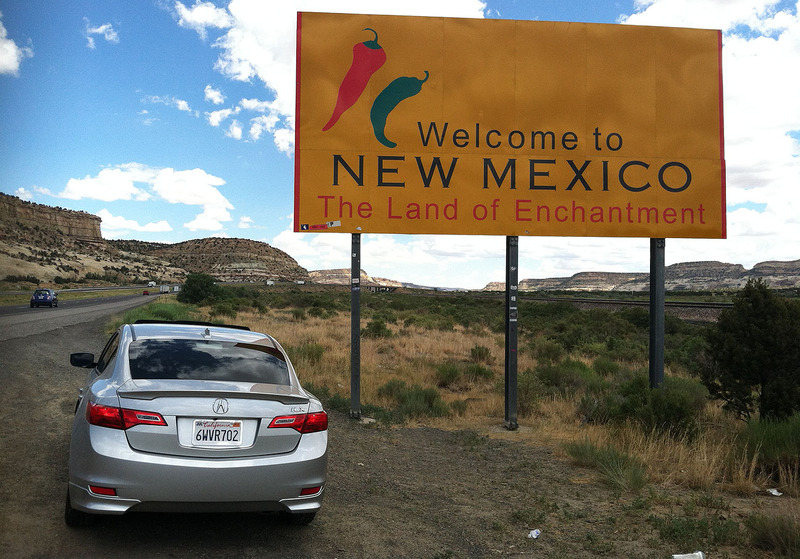 He made the trip from Las Cruces, New Mexico in his 2004 Honda Accord EX coupe 6-speed. The next day was when we REALLY started having fun. More on that soon! 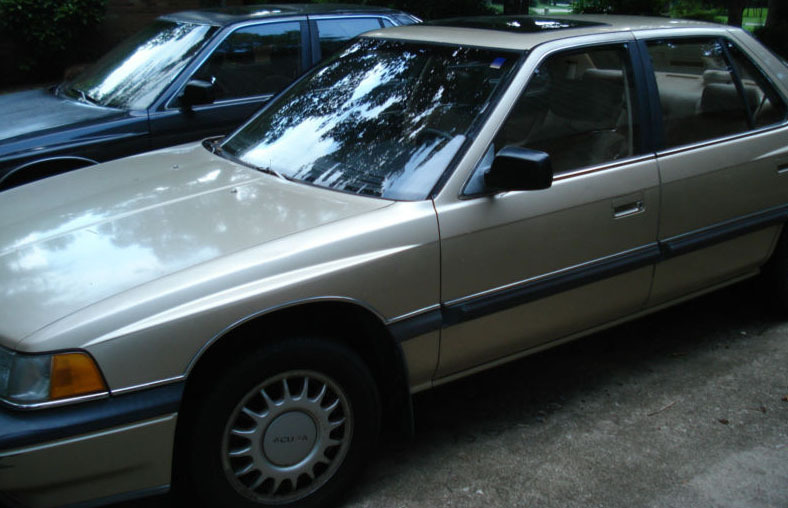 By the way, did anyone else see the 401,000 mile 1988 Acura Legend sedan that ran on Ebay last week? Not too shabby! 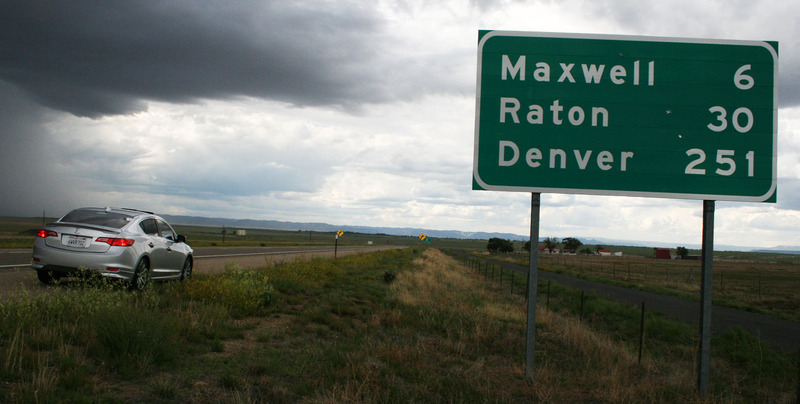 This entry was posted on July 22, 2013 at 6:24 pm and is filed under Colorado, ILX, Road Trip. You can follow any responses to this entry through the RSS 2.0 feed. You can leave a response, or trackback from your own site. Yeah Dave, I started putting my thoughts down and it got way too long, so I figured this trip is best digested in doses! I’m just putting the finishing touches on the video too. I’ll post it tomorrow. Thanks for watching/reading! Stay tuned! I’ll pick up Zuni Fetish souvenir for you the next time I’m rolling through Gallup. There’s also some great turquoise jewelry at one of the service stations in the area! Yeah, apparently Zuni Fetishes are small carved animals. Odd! Oh, good to know! If I had taken 5 minutes to stop and investigate, I could have learned that. I was on a mission to breeze through town and continue to Colorado! You know you loved my pictures and my company! Was great to spend some time with you, and I suppose the ILX too. Here’s to Shania Twain. Any man of mine better walk the line! Better show me a teasin’, squeezin’, pleasin’ kind of time. Hahahaha. Thanks for being a great copilot for a day in the mountains. Let’s do brunch at Hamburger Mary’s again soon. Tyson, glad you got to see the El Rancho. Believe it or not, I’ve actually stayed there a few times even though I used to live just 20 miles east of there. 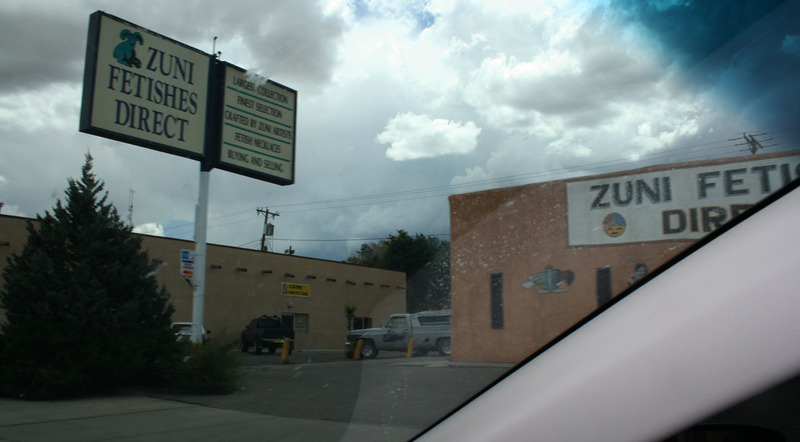 Tia, I’ll stop by next time I’m in town to check out the souvenirs at Zuni Fetishes! 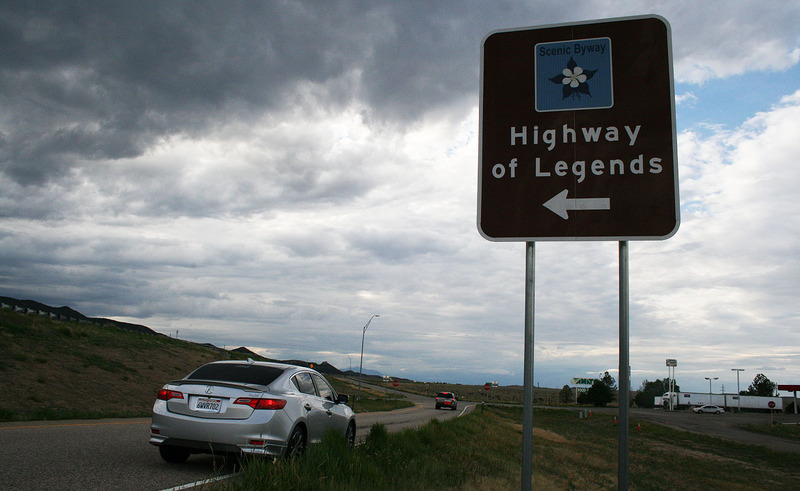 Highway of the Legends would have been a perfect spot for a Legend photo shoot! After seeing this post, now I have a craving for a Five Guys burger. I like to think that MY Five Guys order was the best. I think it was that A-1 steak sauce I had them add. Makes my mouth water just thinking about it. One of these days when I’m rolling through I-40, I want to head south at that Pilot Travel Center near the Continental Divide and visit your grandpa’s place!